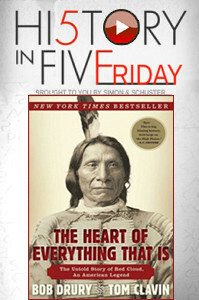 April 1, 2016 – Today on History in Five Friday, presented by Simon & Schuster, we’re going to hear from Bob Drury and Tom Clavin, co-authors who bring us: The Heart of Everything That Is — The Untold Story of Red Cloud, An American Legend . Red Cloud was the only American Indian in history to defeat the United States Army. At the peak of Red Cloud’s reign, the Sioux held dominion over one-fifth of what are now the lower 48 states. Men’s Health Contributing Editor and Military Correspondent Bob Drury has been nominated for three National Magazine Awards and a Pulitzer Prize. He has reported from such global hot spots as including Iraq, Afghanistan, Liberia, Bosnia, Northern Ireland, and Darfur. He is also the author, co-author, or editor of nine nonfiction books. Tom Clavin is a best-selling author and has worked as a newspaper and web site editor, magazine writer, TV and radio commentator, and a reporter for The New York Times.